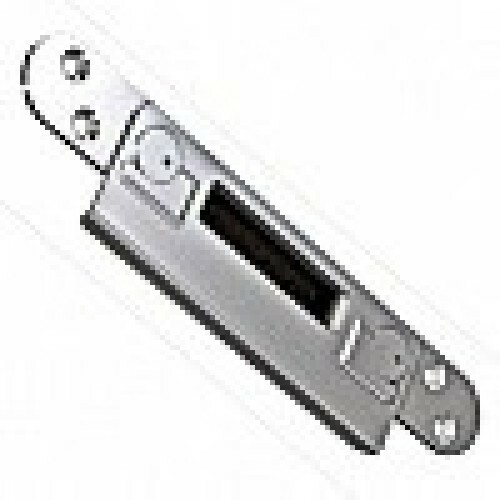 The Winkhaus AV2B is a multipoint lock made for inward-opening uPVC, composite or wooden doors. 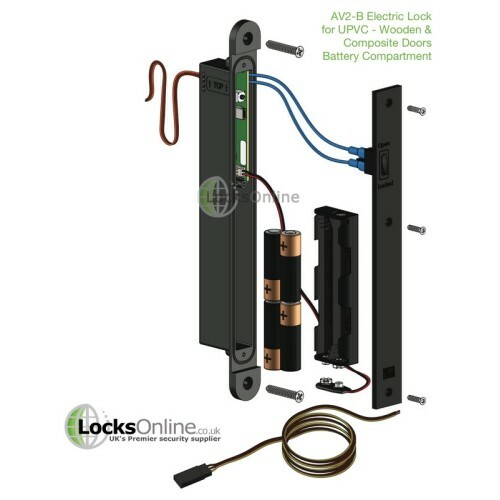 The lock automatically shoots the hooks into their keeps in the door frame when closed, and locks the outside handle, therefore fully securing the door automatically. Then once you wish to gain entry, by using the remote access fob, you can trigger the lock to allow the external handle to be operated to open the door. 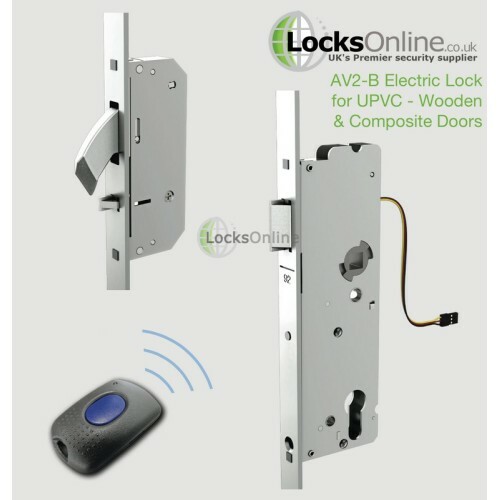 So if you're looking for a keyless locking system that operates using AA batteries, then the AV2 B is the product for you! Boasting the police-approved 'Secured By Design' stamp as well as other security certifications, this lock boasts a fantastic array of design features with an attractive price tag! Whether you are not very mobile at home, or have a shop front that requires opening the door on a regular basis, the AV2 B is remotely controlled by a key fob and therefore may be the ideal solution! This key fob allows you to release the external handle from its locked state so that you can access the property without using a key, but more importantly, without compromising security. 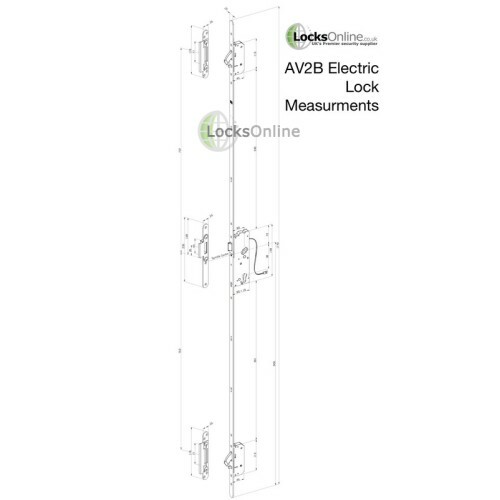 One of the great features on the AV2 B is that it is stamped with the 'secured by design' standard, ensuring maximum security measures have been applied. Not only that, the remote fob has 18.4 billion-billion rolling codes, ensuring it cannot be traced with tailgating. The slam shut design of the AV2 B also acts as a 'crash to exit' lock, allowing any person within the building, to exit fast and easy, should you need to. Saving you cost, the AV2 B does not require an electrician or access control engineer to fit the lock, and is easily renewed power by changing the batteries which last up to 10,000 cycles. Due to being battery operated, there are no trailing wires and has the option of adding an extra 10 key fobs, ensuring all the family can access the house! The lock also comes with a split spindle so the door can be retro fitted to suit your needs. For more information on the AV2 B, please call our team, pop us over an email, or catch us on live chat. We would love to hear from you! Please note, these goods may take up to 5 working days to arrive. If you require them urgently please contact us so we can make checks and try to expedite the delivery for you. 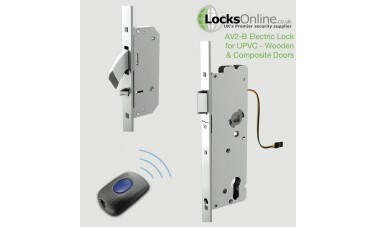 Electric Locks On Composite Doors - LocksOnline exclusive ..
Hi, guys. My name is Darrel, and I'm head of the tech team here at Locks Online. Thanks for taking some time to tune in and have a quick look at one of our product review videos. Now, we're putting these short little videos together to be able to give you, our customers, the opportunity to see the products that we have to offer in hopefully a little bit more detail. We're in the flesh, so to speak. I want to talk to you today about a range of products that we have listed on our website, now from the manufacturers Winkhaus. They're a German family-owned company. 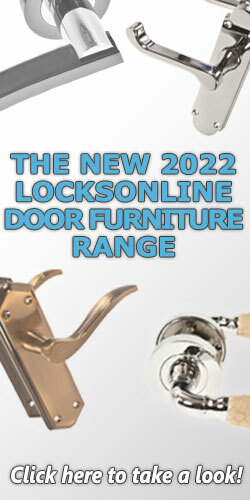 They've been around now for over a hundred years, so they're quite well to do when it comes to locking solutions. You may have known them in the uPVC market, but they're kind of dominating now more in the composite door market or the wooden door multipoint locking solution door market that seems to becoming more prevalent these days. Of course, one of the most important things these days, as well as having degrees of access control or not necessarily relying on a key in which to gain access. Sometimes you may want a remote fob, or you want to be able to have a keypad or intercom system, etc. So Winkhaus, through their design engineers, etc. have come out with this massive range of beautifully engineered, beautifully crafted locking solutions that's designed for electrical operated applications. So today I want to show the AV2B, B being the battery version. Yes, battery version. That's now available. So therefore, you don't have to actually connect any wires or get any power to this particular electric lock. It's obviously, I have a working model here. I want to try and work you through all the different type of models, but it comes as standard with one of these key fobs, as you can see here. One of the beauty with this particular key fob, it has one of these rolling code solutions. Very similar to the security that you would expect on a BMW these days. It's something like about 18.4 billion, billion rolling code permutations that this particular key fob has. You can be relying on the security of this. It's going to be incredibly hard to tamper with the codes in respects to that. Now this particular lock also can have up to 10 fobs will work with this particular lock, and the range is roughly around about the 10 meters, give or take a meter or so. How does it work, and let's go through the operation. From the inside here, this is the actual inside of this particular door. This is a working model of the product. If I wanted to get out, quite simply, drop the handle and out I go. It's as simple as that. It's what we call a crash-to-access solution. When I then go to close it, it closes then automatically. Again, to operate it, no problem at all. Now, if I was to turn this around and let you see which is effectively the outside of the door. If I use to push the handle down, of course, it's not doing anything there, unless I press the code. I press the button, and that operates the engagement. Now I can let myself in. That's the basic operation of it. And then when I go to close it again, then if I slide that in there like that, and now it's back in the closed position. 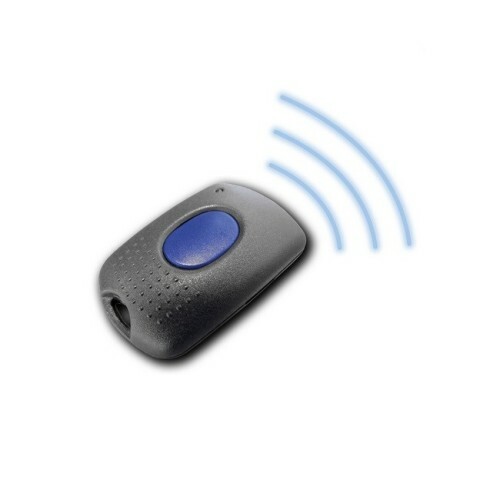 It allows you to be able to use these remote fobs in which to operate the door. Eventually, if there's ever an issue where you need to mechanically override, you can mechanically override with a key like you would do any other type of door, etc. One of the distinct advantages with this particular Winkhaus system is like you say, it's actually driven by batteries. In the back of the door here, on this particular variant here, you can see this is the actual battery box here. 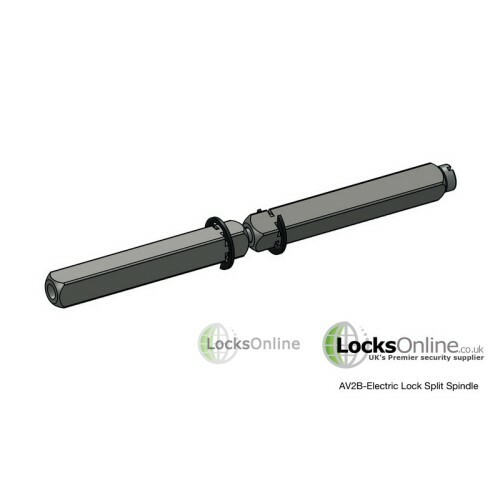 Now, they are available, as well as an option, where you can actually override the locking solution, and allow the lock to become what we call a passage-only solution. Therefore, then it's free exit and free egress at any time. There's an optional switch that's available to work with that particular application. We've also been looking at the wiring ourselves, and we feel also that we can actually wire and integrate this with an access-control solution as well. You need to get a cable to the door in that particular application. But it is doable. We think very strongly that that's possible. We can research that a little bit more depending on the application. Now, one of the most important things with Winkhaus also, what I want to try and show you was how this particular type of locking solution actually works. The easiest way to try and explain that to you is it's these little keeps here that you can see. The idea here is that when the door comes into the frame here, by pushing that in, it drops the bolt automatically. On the lock that comes as standard, there's actually a bolt at the top and there's a bolt at the bottom, and then you've got the latch in the centre. This particular set up here is on what we call a 20 mil rail. In other words, it's a wide rail that's predominantly used in wooden applications, wooden door applications, and also composite door applications. That's the standard size for that. 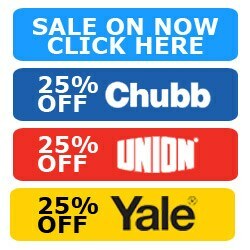 But don't forget, you can also use this on a uPVC door as well. We do have the option also having the slightly narrower, the 16 mil Euro rail that is more common in the uPVC sector. That's well worth noting as well. Another interesting fact as well, I just want to show you that as well, is that we have different back sets available also. Your standard for a uPVC is standard 35 millimetre back set, that's from the leading edge to the centre of where the spindle sits. There's also a 45 millimetre back set also, which is more predominant for the composite door and the wooden door industry. It also have an additional 55 millimetre back set, also available. Winkhaus have really sat down. They've really thought about their application. They thought about their business model, etc. And they are trying to provide a solution that fits all these particular markets. I've got to take my hat off to them. Very well done in that respect. And not only that, they also managed to get some specifications and so forth, so you're in a position here to ensure that the certification to establish that this is the type of locking solution. Now, as I've shown you here, this is a working model just to give customers the idea, the opportunity to see it in the flesh. What I'm going to do is I'm going to pop away now for a second, and then I'm going to actually get one of the locks. Because then it will allow you to be able to see it in the flesh, so to speak. Therefore then if you thinking of installing it, maybe we can have a couple of top tips in regards to how you think that you could fit this into your particular door. Give me a sec, and I'll be back in a moment. Thank you very much. Hi, guys, and welcome back. I wanted to show you the actual product. We managed to get one here on the bench here, so to speak. I wanted to actually go through all the individual parts, etc. Therefore then if you're thinking that this is something that this is absolutely ideal, this is what my application is, this is what I want to do, then let's have a look at it on what is going to take for you to install this. Also, what you need to bear in mind with, is that the Winkhaus, the AV2 family, so to speak, has a complete range. 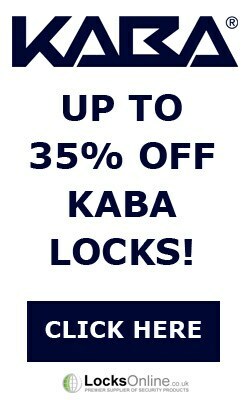 You can actually buy these locks, these slam-shut type of locks, these slam-locked type of locks, without the battery pack or without the electrical versions. Even if there was one already fitted, then you may be surprised to learn that you can easily retrofit. That's well worth knowing as well. Winkhaus, as I've mentioned, is quite dominant in regards to composite door. It may actually be that you might have that lock already fitted, so well worth you exploring that, by all means, give us a call if you're not 100% sure. This is the actual lock. We've got it in the guys for a composite door or for a wooden door. Therefore, it's showing the 20 mil faceplate. But don't forget, you can get a 16 mil faceplate of this particular solution for a uPVC door. It's just that this is the one that we're actually showing you. On the back of it also, you'll see here, here's the connections that would then allow you to connect with this wire, which is about four meters long, to the battery pack here. But this is the part that would sit on the hinge side of the door. Anywhere that you can hide this particular type of solution. In regards to its design and where you want to fit this, that's entirely up to you, within a certain degree. You could fit on the top, if you wanted to. Bear in mind, whether it might get out of there. That's where it's designed, predominantly to fit is on the hinge side. When it comes to programming these, as I've mentioned, we've supply at the standard with one fob, but you can actually get up to 10 fobs, as I mentioned before. Inside here is a little button. You basically press the button, the system goes into learn mode, so to speak. On the back here then, you'll see then, a little push, there's a switch there. By all means, get yourself a paper clip there, pop that in there, you hear a couple of bleeps, and that's it. That's actually now programmed. Really, really straightforward. Another thing to bear in mind as well, as I've mentioned before, you can actually have an override switch, so therefore then it becomes a passage set. In the daytime, or if you can imagine your shop front or something similar where you just want to be able to open it, drop the handle down and in you go, then you can have that bypass. That's the access control solution that we were talking about before. Also, as part of the kit as well, we provide you with a split spindle. 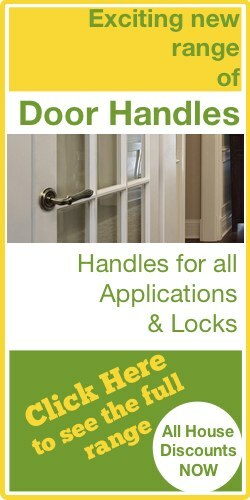 You need a split spindle application with this, so you can actually get around using your existing handles. If you wanted to as well, you could use your existing cylinder, if you're thinking of retrofitting. It might not necessarily be a new install, you may be wanting to fit this as a retro install. That's well worth knowing as well. The reason why I have the handle here is because I just want to show basically the operation here in this respect. As you can see, this has got the 45 millimetre back set there. But one thing that's important to bear in mind, if I can just pop that there to there, is that all of this footprint between all the AV2 model range is all exactly the same. Even if you have a 16 mil rail, this particular position from here to here and so on, down to the bottom of the lock, is all universal standards. That's well worth knowing in respect to that. As I've mentioned before, the way that these lock in is when you close the door into the frame, when these hit the keeps, this gets pushed like that and allows then this bolt, to come out and allows you then to lock the door. That's well worth knowing as well. A couple of top tips in regards to installing these. You've got to make sure that the air gap is around about four millimetres or slightly less. You don't want to be more than four millimetres. Otherwise, it won't push that down enough to be able to throw the bolt out. That's quite important in respect to the operation there. That's well worth knowing also. Now, as I've said, I just drop that in there, and I just pop that into there, and this should allow me now, after I got around the right way to be able to pull that back into position. The way that this works now is that when the actual lock fires off, it releases the system to allow you to pull the handle down. So you still have to have a mechanical way of being able to open the door. You still need to be able to push the handle down. There are different variants of the AV2 which we can show you a different video that actually, physically withdraws everything. It's well worth pointing on the battery version, all it does is allows you to operate the handle from outside and allow you to open the lock. Another important thing to consider, if you're looking at security also, is on this particular lock here, we have some certifications. At the top there, you have a European certification here, which is the VDS. Once I have that there, it also complies with EN15685. Also, EN14846. Amazingly also, PAS24. The most popular one that's more U.K. based, as well as this particular one here, which means that it's actually part of the Secured by Design family as well. That's well worth bearing in mind, if you're considering for insurance applications and so forth, and making sure that it's a security related product, etc. That's well worth a thought. There you go, guys. I think I've covered all the different types of things in respects to these. One thing you'll notice as well, with the ordering auctions, they are handed. You need to make sure whether or not you're ordering a left hand or a right hand, that's quite important. 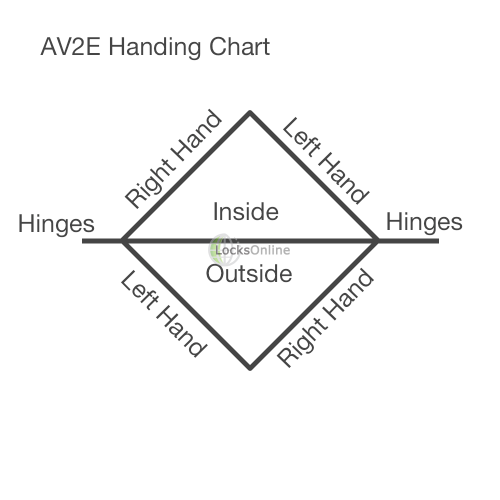 There's a little chart on our website there to indicate how the handing actually works as well. I think I've managed to cover all the bases. If you're looking for a remote way of operating your door, maybe you got a disabled member, can't get to the door, there's an application. Maybe you want to be able to remote control a front door to a club or to a gym, or even a lot now shops in the high street are having access control solutions. Therefore then the door is permanently locked until somebody comes and wants to come in, you can just press the remote fob from behind the counter, and voila, the door automatically opens. Press the handle down and in they go. It has hundreds of different types of applications. As I've mentioned, Winkhaus is a pure bred product of group, so you know that you're going to get great value for money and our excellent product in respect to that. There you go, guys. If you need a bit more information, pop us over an e-mail, use the live chat that we have, or simply pick up the phone and give us a call. Either way, we'd love to hear from you. More importantly, we'd love to see you as one of our customers. From me, Darrel, and all of us at the team, thanks for taking the time to tune in. I hope to catch you real soon. Take care now. Goodbye.